In August 1990, Baja Fresh® Mexican Grill opened its first Mexican restaurant featuring all-fresh, traditional fire-grilled favorites. Like many who grew up on fast food, we realized that it was time for something else, something different and something FRESH. We choose handmade and farm fresh ingredients for our Mexican food, not tin-canned. You'll enjoy freshly prepared Mexican platters, not glorified TV dinners from microwaves and freezers. Baja Fresh continues to be passionate about serving the freshest and highest-quality Mexican food in our bright, clean restaurants. We believe in the benefits of eating well, being active and making a contribution to the communities we serve. We call this philosophy "Live Fresh" and you'll find this attitude in everything we do. National Gift Card is the best place for you to order Baja Fresh gift cards in bulk. We are the experts in all things gift cards and can set up your gift card solutions program for you today. Please contact us for more information on bulk, direct-to-recipient, or individual gift card fulfillment for your gift card program. Contact us here or call us at 888-472-8747 today! Card can be used multiple times. 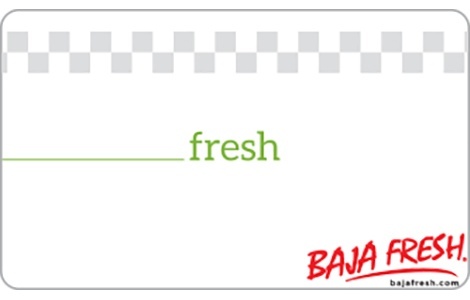 Card can be used to make purchases at participating Baja Fresh® locations. Balances cannot be redeemed for cash or applied as payment to any account unless required by law. This card is transferable and reloadable, but will not be replaced if stolen, lost, or destroyed. Use of card constitutes acceptance of these terms and conditions. Treat card like cash.